Did you ever have the art lessons in school where the teacher would tell you to scribble on a sheet of paper? And then when you were done, you had to color or draw on certain areas that looked like real creatures or objects? I feel like that’s what is happening here. 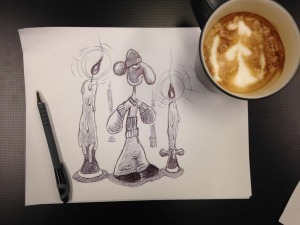 The latte art is clearly bad (there are multiple pages on that site, so click through to see more), but the drawings are pretty good! I have no idea if the latte artist is actually trying to make good art or not. I know it’s difficult and it clearly takes time to learn. I hope that if he is, though, and he starts getting better, that he continues to share his mistakes anyway, hehe. PopChef Review– Does it work? Sure you all have seen the ads for this by now. They’re not just on late-not infomercials and I’ve seen them all around the net. My mom even sent me a link at one point and I saved it with the intent of potentially buying a set. Turns out, my procrastination paid off this time because I was actually asked to review to review them by PopChef via FuelMyBlog! The ultimate question that everyone wants to know when buying “as seen on TV” items is…. And the answer you don’t really want to hear? It really is as easy as it looks when it comes to assembling and creating shapes. The plastic pieces pop together easily and it’s simple to switch shapes in a matter of seconds. The difficult part is actually getting the shapes to come out of the plastic, though. Depending on the food that you put in there, it has a tendency to get stuck. Fortunately, the kit comes with little skewers that will help you easily push it out of the tube, but it somewhat slows down the process of being able to just “pop” the end and force the food out. I found that if a food didn’t easily come out immediately, that it didn’t really make any difference whether I just pushed on the end or really smacked the end of it like they do in the videos. It’s also worth noting that this IS plastic. That sounds like a “duh” comment, but think about it….. do you cut pineapple with with a plastic knife? No? Well then chances are, it’s not going to be so easy to cut through the stringy edges of a pineapple with these plastic cookie cutters of sorts either. I mean… not only is it cheap, but it really does do what it says it will. You can create nice fruit bouquets in a matter of minutes and the most time consuming part is really just slicing and/or peeling the fruit in the first place. I highly recommend choosing soft fruits….strawberries, kiwis, watermelons…or really solid, harder fruits like apples. Don’t bother with pineapple. While it does work, you may find yourself having to clean up the edges with a knife after anyway. And some super hard items like green peppers end up being the same way. I tried it with cheese, too, and loved my little butterfly cheeses! Again, the potential for sticking is there with foods like that, so simply do it one at a time instead of trying to stack several cuts at once. The same goes for sandwiches…. it cuts through the meat, cheese, bread easily, but don’t be surprised if you can’t do multiple stacks at once. Following the instructions is key here! It does give tips in the package materials of which foods you shouldn’t stack too much of or how to remove stuck food. The best part? Even though I got mine for review purposes, they’re actually really cheap. I think they’re well worth the 10 bucks they’re going for, assuming you have the space to store all the pieces. You may not use it very often, but if you have kids, they’ll love playing around with it and it helps add a little flare to gatherings where you’re the one providing the veggie trays or the finger sandwiches. I saw one woman complain that while the items were cute, she ended up with a bunch of wasted food. I don’t see the “scraps” as wasted at all, though! Just toss all the scraps of the veggies into some soup…..the fruits into a Ziploc bag to be turned into smoothies later….and the cheese into some macaroni and cheese. Nobody is going to even realize that they weren’t whole fruits or veggies being used. Oh, and as for the sandwich scraps? Who likes eating the crusts anyway….? ;) If you do, then fine…considering those your snacks while you ‘taste test’ the varieties. Definitely don’t waste them, though! I have NOT gotten to try these on all the different foods that they recommend. I’ve seen them used for cookies and such, but I feel like regular cookie cutters work fine for those. The PopChef is more for items that you wouldn’t normally be able to use cookie cutters for. For example, most cookie cutters have a ‘top’ of sorts that would make it nearly impossible to cut sandwiches with. And cookie cutters are often larger, too, so you’re not going to be making delicate butterflies and flowers out of kiwis with them for a fruit basket. I haven’t used it much for veggies yet, but I’d like to see how it holds up for making a full tray of stars and hearts. I have a feeling that the “pop” portion works better with veggies that aren’t potentially moist or sticky like fruits and bread. You can get it online for 10 bucks plus shipping and handling (6 bucks) at their website. I’ve seen them in stores at this point, too, but I don’t know how much they’re going for. 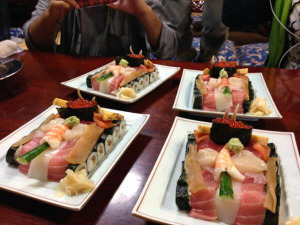 I know I could easily fill an entire blog with just quirky bento boxes and another of creative sushi creations. I can barely keep up with getting posts up regularly for this one, though, so you’re stuck with seeing an overwhelming amount of Asian dishes around here sometimes. 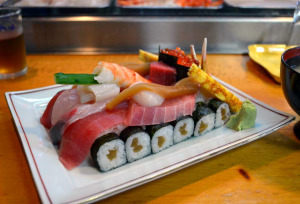 These sushi tanks are actually inspired by a Japanese anime series, Gurls und Panzer (Panzer is German for ‘tank’). I wish I knew how much these cost, but I can’t seem to get any additional information about these than what I just told you.